When it comes to executive presentations, our clients know we’re just a phone call away for a quick slide update, a refreshed graphic, or a complete design overhaul. At Ballyhoo, we partner with our clients to make their lives easier and enable them to shine in the best light. We design presentations to fit a presenter’s personality, enhance their skills and, most importantly, their comfort level. We’re here to help you focus on the content while we make it look good! The good, the bad, the ugly – we’ve seen it all in executive presentations. By dissecting the slide we can ‘ballyhoo’ the standard to stand-out! 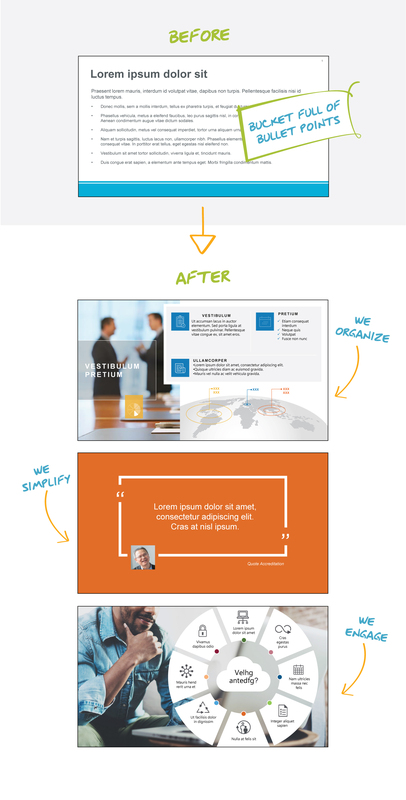 Give us a call to talk about your presentations and dissecting the slide to make it pop!